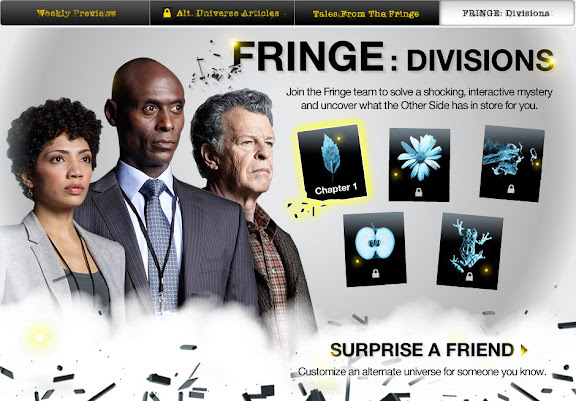 The Fox Fringe website has a new section called "Fringe: Divisions", on which you will be able to "Join the Fringe team to solve a shocking, interactive mystery and uncover what the Other Side has in store for you." The first chapter is a simple introduction by Broyles and Walter. If you log in using your facebook profile, it will use information in your account to tell you about your Alternate self. Then you have the option to enter more personal data (name, email, and phone number) so you can be notified when the next chapter is ready. @SZ Oh dear! Mine wasn't as bad as yours. I was married to someone I'm particularly fond of, I was a lawyer, had one kid, and lived in Rome. Wow creepy! I was married to a guy that I also am quite fond of lol. One kid which I already have one child. I am a doctor which I found interesting since I am in the medical field and I live in Amsterdam. Apparently my alt-self is a teacher in New Dehli... but my "married to" page was blank. I guess my alt-self is just as single as I am. The formulas need to be definitely need to be changed. Hahaha, I was married to the observer! (September) I thought it was pretty hilarious.